[Corrected 12/5/15, 2:56 pm. See below.] Many companies that provide online data storage services also offer tools that make it possible for business project teams to collaborate online. Common projects include jointly editing documents and logging sales activity so all can share the data. But creative teams also collaborate—and now tech companies are addressing the particular needs of groups that create music, artworks, advertising displays, and storytelling productions. Investors gave two such Silicon Valley startups a leg up this week so they can build out their software and expand their markets. —San Francisco-based Figma announced a $14 million Series A round as it unveiled its Web-based visual design suite, and invited professional teams to try out the preview version. It’s free for now. Instead of working alone on distributed computers and then exporting or e-mailing their work to other team members, designers can enter Figma’s shared online workspace to contribute to group projects. The system saves and tracks the multiple versions of the work as it advances toward completion. It also includes features common to business collaboration environments, such as a shared comments section and mechanisms to allow access only to authorized team members. Other resources include a common library of resources, such as a standard color palette for the project. Figma’s Series A was led by Greylock Partners, with participation by prior investor Index Ventures, which led Figma’s $4 million seed round in 2013. Greylock’s John Lilly is joining Index’s Danny Rimer on Figma’s board of directors. Other investors in the Series A round include O’Reilly Alphatech Ventures, Iconiq Capital, and LinkedIn CEO Jeff Weiner. 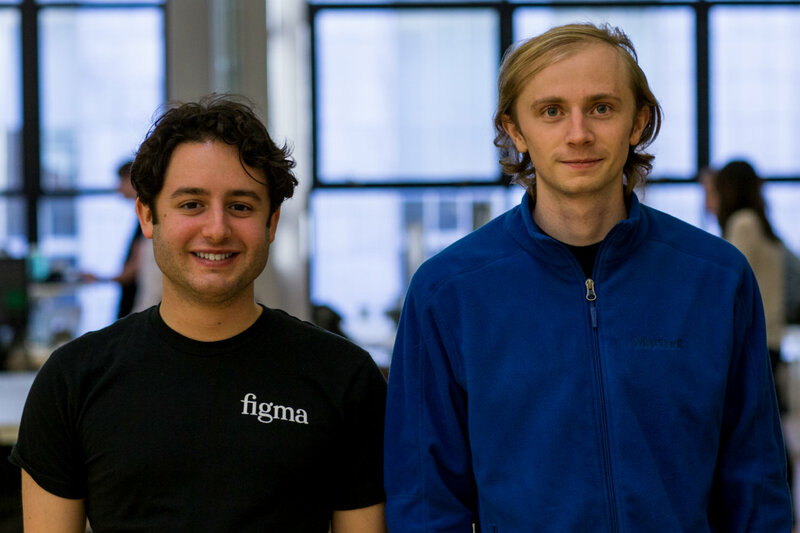 In 2012, Figma CEO Dylan Field co-founded the company with Brown University classmate Evan Wallace. That year, Field participated in Peter Thiel’s “Thiel Fellowship” program, which encourages college-age people to translate their ideas into startup businesses. Field and Wallace (pictured above with Field at left) are encouraging design teams to take Figma for a spin and give them feedback so they can refine its features. The company may introduce a pricing structure in 2016. The startup plans to give digital design giant Adobe a run for its money. San Jose-based Adobe (NASDAQ: ADBE) sells major design software products including Photoshop and Illustrator. The company offers users the ability to work on their design projects both on their desktop computers and on mobile devices, which can each be connected to its Creative Cloud. Soundtrap, headquartered in Stockholm, Sweden, established its Bay Area beachhead while in residence at the incubator Nordic Innovation House in Palo Alto, CA. In July, Soundtrap launched its online music and audio recording studio, which allows people scattered across the globe to work together on a sound production using a variety of devices and operating systems. As 2015 began, the company had 20,000 users on a beta version of the sound studio. It now claims 250,000 users in 200 countries and more than 1,000 schools. Soundtrap says it’s making inroads in education because the studio tools are easy to use. The startup is a Google for Education partner. Soundtrap is using its capital infusion to further develop its software. It is also expanding its Palo Alto presence.